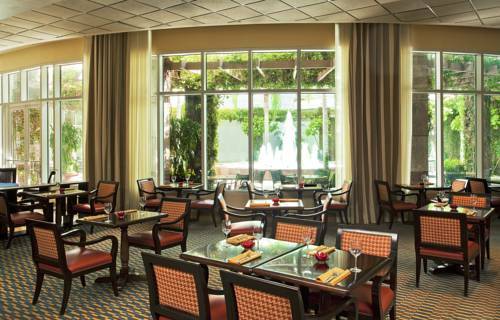 Surrounded by swaying palms, Sheraton Suites Fort Lauderdale Plantation boasts an eclectic and welcoming design. Our all-suite, full-service hotel is within walking distance to the Westfield Broward Mall, close to major office complexes and just 10 minutes from Fort Lauderdale's famous beaches. 263 spacious suites are filled with extras to make your stay comfortable and convenient. Stay connected with high speed internet access, available in your guest room and public areas. Overlooking the Ft. Lauderdale skyline, our beautiful 25-meter rooftop pool is a great place to relax and soak in the warm Florida sun. Enjoy an interactive space in our lobby featuring four computer stations, high speed internet access, ethernet data ports for lap tops and a wireless signal. Our friendly staff looks forward to welcoming you to Sheraton Suites Fort Lauderdale Plantation! Cilantro's: Overlooking our beautiful outdoor veranda, Cilantro's provides an elegant setting to enjoy a breakfast buffet or lunch offering salads, soups or sandwiches.